When I started working at Lands' End, back in the early 1990s, I was surprised how few companies calculated lifetime value. When I work with companies in 2015, I am surprised how few companies calculate lifetime value. I know, I know, you don't have all the proper cost metrics and you use web analytics software that only allow you to evaluate campaigns and as a result you perceive that it is impossible to perform lifetime value analytics and you don't care anyway as long as your campaigns deliver an acceptable ad-to-sales ratio so so what? All of the magic in your business comes from understanding how customers behave. No, not how they behave in campaigns ... but how they behave. Do you have the table illustrated above? Do you review the table, at least quarterly? No? Why not? The query is terribly simple. Identify all customers who purchased as of April 6, 2014. 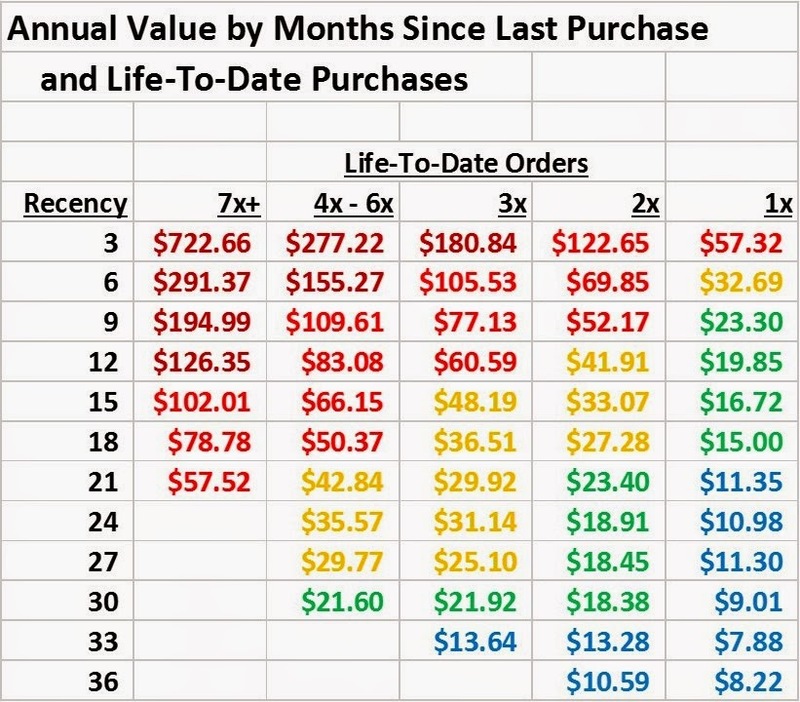 Segment those customers based on recency (three months increments) and life-to-date orders (1x, 2x, 3x, 4x-6x, 7x+). Then, for each segment, calculate the average amount of demand spent by the customer in the next twelve months. Produce the table outlined above. And yet, there's a lot of value to be had from reviewing the table. Notice how few high-value customers there are? Now look at all the low-value buyers (green and blue). Notice that a first-time buyer quickly moves into low-value status if the customer does not repurchase within six months. Don't you think that's something your whole company should know? Shouldn't every employee know that you have six months to convince a first-time buyer to purchase again, or the customer will descend into low-value status, requiring you to acquire another customer? Wouldn't your marketing team want to craft programs to convert the customer to a second purchase within that vital six-month period of time? You don't have to perform a full lifetime value analysis to do the right thing. Just replicate the table above. It's not hard to replicate the table - the queries are terribly easy to replicate. Then identify the blue/green segments above, and do something to prevent customers from falling into the blue/green segments. By doing just this small amount of work, you replicate 80% of the value of a lifetime value program. Take the table above and convert it to profit, and you are 90% of the way there. And you've done virtually no work! If you cannot produce the table, contact me (kevinh@minethatdata.com) and I'll do it for you.